Welcome to my blog!! Young adult literature isn't just for teens anymore! I will post reviews of mostly current and some older YA books of interest. I had hoped to be through a couple more books by the end of this week, but inevitably something almost always comes up. However, I did get through 3 books so far. Overall, I thought this debut novel by Kiersten White was a unique take on the YA Paranormal genre. I love it when writers can make you really care about the characters and want to get to know them. I got a clear picture in my head of what the characters looked like, what their expectations were, and what their personalities were like as a whole. These characters could be people you knew in your everyday life. Teenagers that have the same insecurities and issues that we can all relate to, what if I'm not good enough, what if he doesn't really like me like that, etc... I would definitely say that this novel is more geared toward girls, but wouldn't be unenjoyable for a boy to pick up either. The only reason that I gave it 4 stars instead of 5 is that I felt it was a little slow moving for my personal taste. Otherwise, this book was well written and I would definitely recommend it to teens in my library. A book trailer from HarperTeen. I’ll begin with Lucy. She is definitely first on the list. You can’t believe how it feels to be in the cafeteria and turn around and there she is staring at me like I’m some disgusting bug or vermin. Does she really think I WANT to be this way? I hate you, Lucy. I really hate you. You are my #1 pick. I wish you were dead.The day after anonymous blogger Str-S-d wishes the popular girl would die, Lucy vanishes. The students of Soundview High are scared and worried. Especially frightened and wracked with guilt is Madison Archer, Lucy’s friend and the last person to see her the night she disappeared. As days pass with no sign of the missing girl, even the attention of Tyler, an attractive new student, is not enough to distract Madison from her growing sense of foreboding. When two more popular students disappear after their names are mentioned on Str-S-d’s blog, the residents of Soundview panic. Meanwhile, Madison receives anonymous notes warning that she could be next. Desperate to solve the mystery before anyone else disappears, Madison turns to Tyler, but can she trust him when it becomes clear that he knows more than he’s sharing? The clock is ticking. Madison must uncover the truth behind the mysterious disappearances . . . before her name appears in Str-S-d’s blog. In the spirit of stories like I Know What You Did Last Summer, Todd Strasser updates the teen thriller for the techno age with Wish You Were Dead, the first installment in a new “thrill”-ogy. I almost always like anything by Todd Strasser. I find that his writing evokes such emotions in me that help me to engage even further into his stories. I'm sure that if you have read my other reviews, you by now have realized that my favorite kinds of books have characters that real people can identify with. Wish You Were Dead is no different. I think at some point we can all relate to being bullied or have felt like karma will get'cha. Sort of like driving on the freeway and some crazy driver speedracers past you and you just hope that there is a cop sitting around the bend. This happens to the "secret blogger". She feels like wishing someone is dead causes Lucy, Adam, and Courtney (the popular kids/the bullies) all to be kidnapped. The only thing that threw me with this book was the actual villian. I thought it was a little bit of a stretch. Overall, I did enjoy this book and would probably recommend it to 7th grade students and up. In this Groundhog Day meets Mean Girls teen hybrid, Sam Kingston is pretty, popular, and has a seemingly perfect boyfriend. But after a late-night party everything goes terribly wrong, and the life that she lived is gone forever. Or is it? If I could give this book a million stars I would. I literally just finished this book 20 minutes ago, loved it so much that I had to stop what I was doing and blog about it immediately. Sam Kingston is part of the popular clique. She can do what she wants, when she wants, to whomever she wants. Because if you're popular there are no rules. But, unfortunately, being popular doesn't stop you from facing death. For Sam, her life ends without her really ever appreciating real happiness. But lucky for her, Sam gets to relive her last day seven times. Each day she learns a little more about herself, gains a little more confidence, and starts to appreciate what is really important in life. This book broke my heart and made me smile from ear to ear all at the same time. There have been very few books in my lifetime (all 29 years of it!) that a book has moved me so much. Every teenage girl should pick this up and read it. I dare you not to shed a tear. 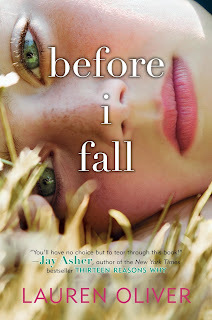 A blog/reading log of mostly current young adult books. Joining the Book Blogger Hop!